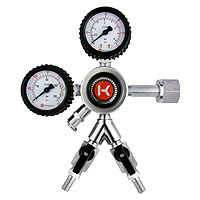 Boasting a commercial-grade construction, Kegco's new HLHL Series CO2 Regulators are perfect for providing maximum convenience and durability in busy commercial environments. 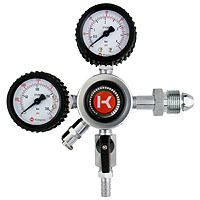 These brewery-grade regulators feature a multi-stage body for more precise control when making small adjustments to the output pressure. The first stage reduces the output pressure from the tank to a more manageable pressure, and the second stage fine tunes that pressure for output to the keg, allowing adjustments to be optimized for the operational range of beer, wine, coffee or whatever you're dispensing. A large adjustment knob allows you to make quick and accurate adjustments by hand and turns effortlessly, even in freezing temperatures.